Huge game selection? Check. Massive bonus offers? Check. Plenty of safe payment methods to choose from? Check, check, check! Mucho Vegas ticks all the right boxes when it comes to providing a safe, varied online casino site to play popular slot games for the chance to win real money. 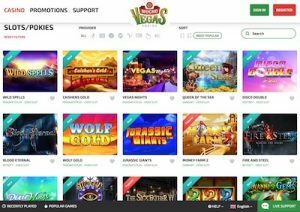 We review the Mexican-themed Mucho Vegas Casino to see why so many players are turning to this site to play the best online pokies. For our international readers, “pokies” is an Australian slang term for slot machines. All information that refers to pokies across this review and the rest of our site is completely interchangeable with the word slots – both terms mean the same thing. Check out our pokies terminology guide for more slots-related lingo. Mucho Vegas offers a fully instant-play casino site, so no downloads are required, ever. Just load the casino directly over your Web browser and click to load whichever game you want to play. The same goes for Mucho Vegas’s mobile platform, where a selection of the most popular pokies can be played download-free using a mobile Internet connection on all major smartphone and tablet makes and models. But there’s also plenty more where that came from. Once the welcome package has been exhausted, Mucho Vegas has several ongoing promotions to take you through the week, like Free Spins Monday (deposit on a Monday to get up to 100 bonus spins) or Taco Friday Bonus (get a 30% match up to $300 to kick start your weekend). Mucho also encourages players to try new games with the Game of the Week promo, where the casino will give you 20 extra spins to use on a selected new game release if you deposit and wager a certain amount of money on that new game. Note: All Mucho Vegas bonus offers come with wagering requirements attached (an amount of money you need to deposit and play-through at the casino before you can withdraw any of your bonus money or winnings made from bonuses) so always be sure to read the terms and conditions of any promo offer first so that you understand the fine print. Our personal faves are 3D pokies that form BetSoft’s Slots3 collection, with game offering true cinematic animation and heaps of bonus features. Mucho Vegas also hosts an impressive selection of progressive jackpot pokies, with local area progressives from BetSoft and iSoftBet including popular titles like Greedy Goblins, Mr Vegas, Platoon, Rambo and It Came from Venus. Other casino games available at Mucho Vegas include multiple variants of blackjack, roulette, baccarat, table poker, video poker and live dealer games from Evolution Gaming. All games (bar live titles) at Mucho can also be sampled for free in practice mode first, so you can trial games without committing to risk any of your own money. It’s disappointing to see that no pre-paid methods are available, with most of our other recommended pokies sites accepting either Paysafecard or Flexepin. Mucho Vegas also only allows withdrawals to be made using bank transfer, Visa, Neteller and Skrill. Accepted currencies: AUD, EUR, USD, SEK, NZD, NOK, BRL, MXN, ARS and ZAR (others will incur currency conversion fees). Mucho Vegas is licensed by Curacao eGaming, a globally trusted online gambling jurisdiction approved by the Government of Curacao, under license no. 1668/JAZ. The site is fully protected by 128 Bit SSL (secure socket layer) digital encryption which works by scrambling all information sent over the secured connection, so you can enter personal information and make payments with the comfort of knowing your details are safe.